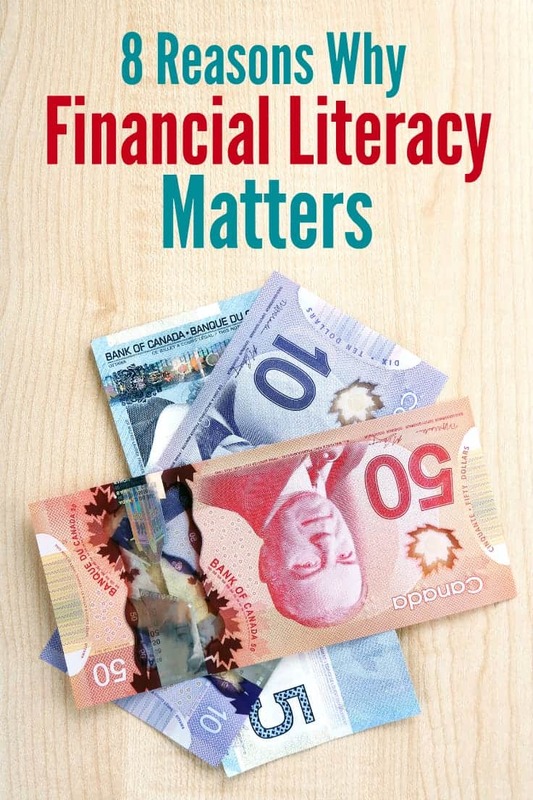 Did you know that November is Financial Literacy Month? To me, financial literacy means having a basic understanding of how money works. I know that’s pretty broad because there are a ton of topics to cover under the money umbrella. This month, I’m talking stock of my finances and seeing if there any ways I can improve. I encourage you to do the same! My own financial literacy has improved leaps and bounds over the past 10 years. I was like a fish out of water when I first started out on my own. I knew nothing about credit cards, loans, investing and had no financial goals. The state of my finances back then clearly showed my lack of knowledge and direction. My husband and I made many bad financial decisions and I shake my head now as I reflect on them. Many could have been avoided if I’d had a basic understanding of how money works in the real world. I’ll give you one quick example of a bad financial decision my husband and I made. We purchased an expensive stereo system and financed it through a lending company with a crazy high interest rate. At the time, we didn’t even blink at the rate. We just wanted to take the system home TODAY. It wasn’t until months later as I was taking a look at where all our money was going that I discovered we would be paying almost double what the item was worth in interest alone. That fact made me sick to my stomach. No piece of stereo equipment would ever be worth that amount. I instantly regretted buying it. I have many, many more examples I could share like this one. I learned about finances the hard way: through real-life mistakes. I believe that many of these errors could have been prevented had I been more financially savvy and maybe a little less naive. The good news is that it’s not hard to learn about financial literacy; you just have to know where to look! RateSupermarket.ca is my trusted source for all financial topics. I’ve been an email subscriber for several years and find their articles and information to be reliable and easy to understand. I know I’ve become more financially savvy and have a better handle on managing money because of the information I’ve learned on their site. They are also a wealth of information. For example, they recently published their 2015 Best of Finance Awards, a ranking of the hardest working credit cards and banking products in Canada. Sharing helpful information that Canadian consumers can use and apply in their own lives is something they excel at. Understanding how to manage money has helped to turn my finances around. Instead of always being the red every month, I now have tangible assets, investments and don’t live pay cheque to pay cheque. I’m like a completely new person, in the financial sense, anyways! A switch went off in my head years ago. I realized that knowledge is power and set out to learn as much as I could about personal finance, particularly getting out of debt. The more you know about a topic, the better decisions you can make for your family. I made it my mission to become financially literate. Here are my 8 reasons why I think it’s important to understand money. 1. Choice is everywhere. With so many options available to consumers, it’s hard to know which one is the best. From different kinds of credit cards to loans to investments, how do you know which option to choose? It’s like a buffet with a variety of yummy looking selections. You can’t try them all because your plate is only so big. Having a basic understanding of your options is key to making sound financial decisions. 2. Increases your confidence. I used to feel so stressed out when faced with anything financially related. I relied on other people to tell me what to do. Now, as an informed consumer, I feel better in the choices I’m making. If I want to compare my options, I can easily check out what’s available on RateSupermarket.ca. Their goal is to help Canadians find the best rate for mortgages, credit cards, bank accounts, savings accounts, GICs, and insurance quotes. 3. Teach your kids. As parents, it’s up to us to teach our children how money works. This way when they do venture out on their own, they don’t have to learn the hard way! My parents taught me a little bit. I knew money was a finite resource with my dad’s slogan, “Money doesn’t grow on trees”. I had zero inkling about debt and its consequences. It will be different with my daughters as I’m working on raising money smart kids. 4. Spot a scam. As someone who has been a victim of credit card fraud, I can tell you from experience that it is awful! I made many mistakes with my credit card and allowed myself to be an easy target for thieves. Boy, have times changed! I’m well aware of what credit card scams to watch out for. Don’t be a victim! 5. Get the best value for your hard earned dollars. Before I make any big financial decision, I research as much I can on the subject. For instance, I recently purchased life insurance. I needed to figure out what kind of life insurance I should buy and where I would find the best deal. RateSupermarket.ca makes it easy to compare your options for all kinds of financial decisions, including life insurance! 6. Manage debt before it manages you. I’m a prime example here with my high interest loan for that stereo system. If I knew then what I know now, it would have never happened. Prevention is great, but if you find yourself already in a bad situation carrying lots of debt, learn your options and how you can reduce it starting today. 7. Set financial goals. I’m a firm believer in setting goals and then tracking progress towards it. Whether your financial goal is to buy a home, save for retirement or a vacation, you’ll be ahead of the game by making a plan of how your going to reach that goal and then putting it into action. Setting goals allowed me to buy a home and now I’m currently focusing on saving for my daughters’ post-secondary education. 8. Better quality of life. Understanding your finances means less stress. You’ll always know where you stand financially and you have a plan in place to reach your goals. I hated feeling confused about where my money is going and felt like I never would have enough to cover my bills. By taking control of my finances through budgeting and learning about money, I’m in a better position now to handle whatever life throws my way. I don’t feel like I’m in the dark anymore. Start your journey to financial literacy today by checking out RateSupermarket.ca. If you follow the principle of 1% infinity where every day, you learn a little bit about managing personal finances, you’ll be well on your way to becoming money-smart. The savvier you are about money, the better financial decisions you’ll make! Do you think financial literacy is important? If so, why? Connect with RateSupermarket.ca on Facebook and Twitter. I am so thankful that I am married to an accountant and he keeps me in check. Money burns a hole in my pocket. Financial literacy is SUPER important. Your finances are one of the most important aspects of your life, and you can’t manage them if you don’t know what you’re doing. You need to be this way if you want to ever have money. This tips are awesome and something we actually follow. We spend money only when we have it. It is fun to go on vacation not owe anything after. I think we need to teach our kids from a young age about finances. I need to see if there is a RateSupermarket.ca type service for the states. To prevent our kids from struggling the same way we often do, we need to teach them the value of money and how to manage it. I agree that financial literacy is important. I was on my own since college, so I had a lot to learn early on, but it was valuable. I definitely think financial literacy is important. These are great tips! You’re so right about this. It surprises me that kids don’t learn a lot about real-word money management in school. I’ve also heard a lot about elderly people being scammed over the phone! I completely agree- it can be so very overwhelming to decipher what is good or bad practices and choices when making individual financial plans. Thanks for the tips. It’s very important. I think everyone should be in the know when it comes to financial topics because it can be very overwhelmling and knowing about your own finances is a must – keeping on top of it is so important because you just never know. This is so important! There are so many scams happening lately, it is important to keep on top of everything. Financial literacy is very important and one that I talk about with my kids. They need to understand how important it is as well. Financial literacy is always important, both for kids and adults. In fact, I think learning how to spot and REPORT email scams is super important during the holidays when cyber criminals are out in force trying to take advantage of everyone’s holiday cheer. This is very important. I’ve been scammed a few times, too and I’ve learned my lessons. I have an MBA and I still find finance tough at times. One of the best gift you can ever give your kids is a sense and an importance of money. You have to be smart about money! It really helps determine your future!